https://nashville.bintheredumpthatusa.com/dumpster-rental-lebanon	Bin There Dump That Nashville	https://nashville.bintheredumpthatusa.com/img/franchisees/59.jpg	7913 TN-100, Nashville, TN	Contact us for more details. 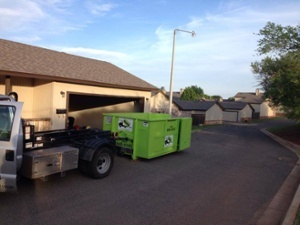 Discover how we make renting a dumpster in Lebanon, TN a simple and easy process. Bin There Dump That is committed to making the dumpster rental process for the customer a seamless transaction, from placing an order for the needed dumpster size to delivery of the waste container in Lebanon to an immediate pick up when you no longer need the bin on your driveway. How long will it take for a dumpster to arrive? Bin There Dump That can deliver your dumpster in 24 hours or less! For any last minute projects or de-cluttering sessions, we have what you need. You can either book a dumpster for a later time, or you can book it for the next day. We assure you that we will arrive on time with the perfect dumpster for your project. You don’t need to be home for delivery nor pick up. We have all the information we need once you speak with one of our Dumpster Consultants. Call now for more information on how to rent your world class residential friendly dumpster. Lebanon TN is located in Middle Tennessee just east of downtown Nashville and is the county seat of Wilson County. Lebanon is considered to be part of the Nashville Metropolitan Statistical Area and local residents have called Lebanon "Cedar City", because of the abundance of cedar trees in the area. Cumberland University which is a small private institution is located in Lebanon TN. Lebanon is also host to the annual Wilson County Fair. The Wilson County Fair has been considered to be the best County Fair in the state of Tennessee and has also been listed as one of the top 50 fairs in North America by attendance in 2008, 2009, and 2010. Your local Dumpster Rental Lebanon, TN dumpster rental operator is Joey Bossier.